Centrally located in Melbourne, InterContinental Melbourne The Rialto is within a 15-minute walk of Bourke Street Mall and Eureka Tower. This 5-star hotel is 0.8 mi (1.3 km) from Melbourne Central and 1.2 mi (1.9 km) from RMIT University. Make yourself at home in one of the 253 air-conditioned rooms featuring refrigerators and minibars. LCD televisions with satellite programming provide entertainment, while complimentary wireless Internet access keeps you connected. Private bathrooms have complimentary toiletries and hair dryers. Conveniences include safes and desks, and housekeeping is provided daily. Pamper yourself with a visit to the spa, which offers massages, body treatments, and facials. If you're looking for recreational opportunities, you'll find a health club, an indoor pool, and a spa tub. Additional features at this hotel include complimentary wireless Internet access, concierge services, and gift shops/newsstands. Enjoy Modern European cuisine at Alluvial Restaurant, one of the hotel's 2 restaurants, or stay in and take advantage of the 24-hour room service. Relax with a refreshing drink at one of the 2 bars/lounges. Buffet breakfasts are available daily from 6:30 AM to 10:30 AM for a fee. Featured amenities include complimentary wired Internet access, a 24-hour business center, and limo/town car service. Planning an event in Melbourne? This hotel has facilities measuring 4306 square feet (400 square meters), including a conference center. 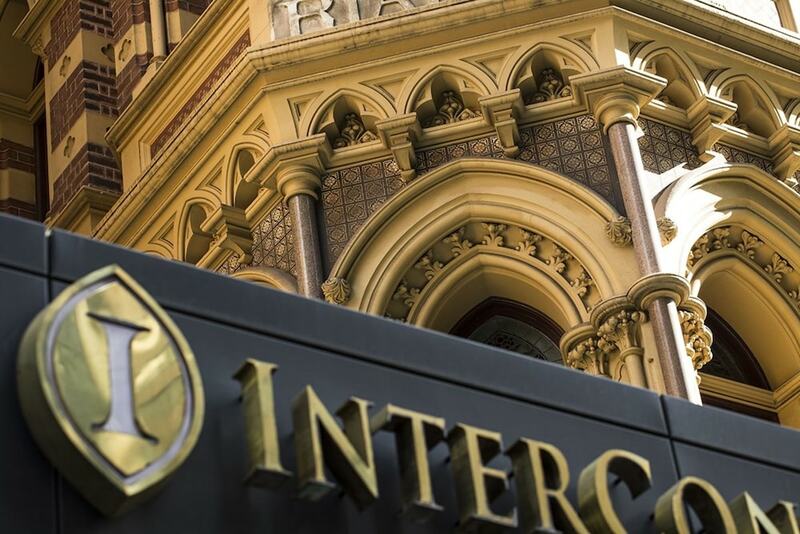 In addition to a full-service spa, InterContinental Melbourne The Rialto features an indoor pool and a health club. Dining is available at one of the hotel's 2 restaurants. Guests can unwind with a drink at one of the hotel's 2 bars/lounges. A computer station is located on site and wired and wireless Internet access is complimentary. Business-related amenities at this 5-star property consist of a 24-hour business center and limo/town car service. Event facilities measuring 4306 square feet (400 square meters) include a conference center. This luxury hotel also offers a spa tub, a sauna, and spa services. Parking is available onsite for a surcharge. InterContinental Melbourne The Rialto is a smoke-free property. Alluvial Restaurant - This restaurant specializes in Modern European cuisine and serves breakfast, lunch, and dinner. Guests can enjoy drinks at the bar. Happy hour is offered. Merchant - This restaurant specializes in Italian cuisine and serves breakfast, lunch, and dinner. Guests can enjoy drinks at the bar. Blue Stone Wine Lounge - Onsite wine bar. Happy hour is offered. Market Lane Bar - Onsite piano bar. Happy hour is offered. Botanica Day Spa has 4 treatment rooms including rooms for couples. Services include deep-tissue massages, hot stone massages, Thai massages, and facials. A variety of treatment therapies are provided, including aromatherapy, Ayurvedic, and hydrotherapy.